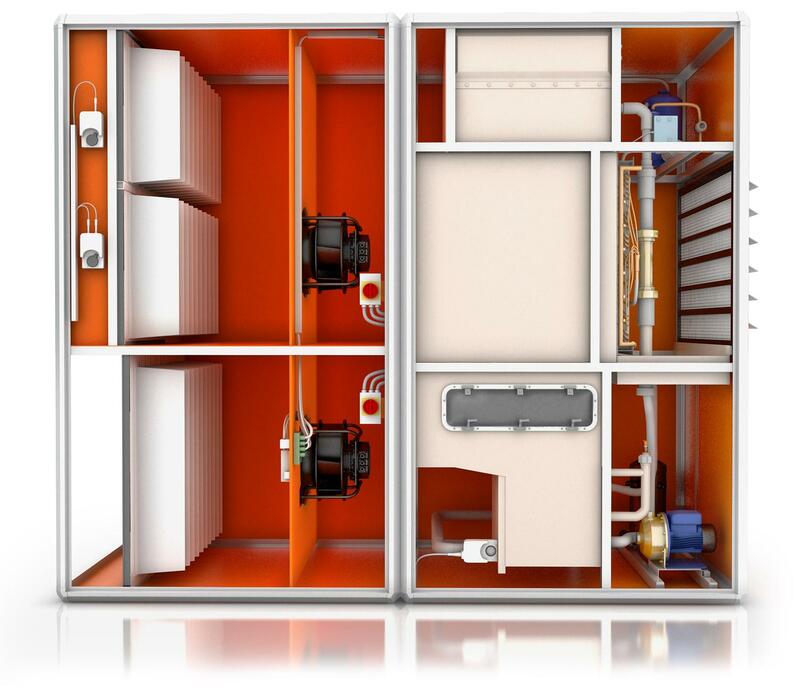 Thanks to the combination of indirect free cooling, adiabatic evaporative cooling and the integrated output-regulated compressor refrigeration system, each of which supports the effectiveness of the others, the Adcoolair 75 unit series allows heat dissipation in recirculation mode from data processing centres and other rooms with high thermal loads, with minimal space requirements, low air pressure drops within the unit and very little energy consumption. The use of energy-efficient EC fan units, in combination with a demand-based flow rate control system, additionally contributes to the reduction of operating costs. The Adcoolair 75 unit series is optimally adapted to high return air temperatures. The combination of first-class components with precise control and regulation systems guarantees economical operation at all times. 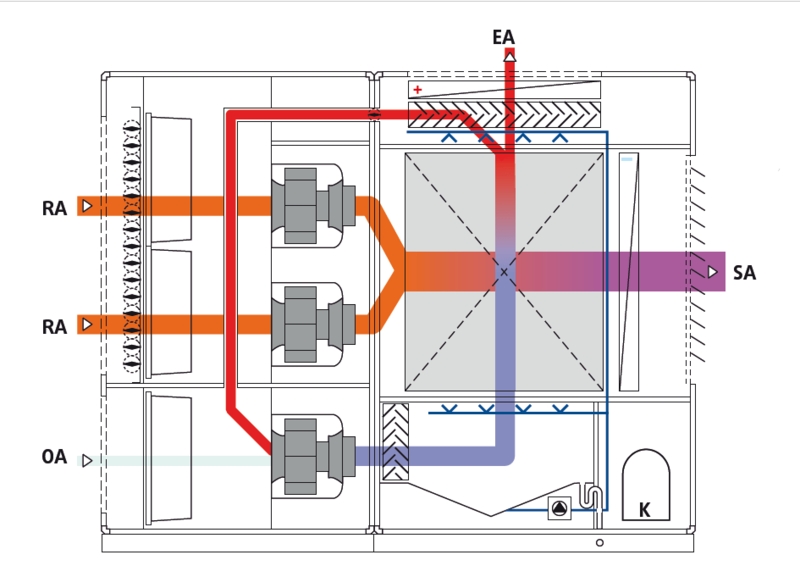 The warm process air from the room with high thermal loads is drawn in via the return air fan and through an asymmetrical cross-counterflow recuperator. In order to extract the heat from the process air. The outside air is passed through the recuperator in a second air flow path, physically separate from the process air. The process air is cooled down in the recuperator through the cooling potential of the outside air. The outside air is variably adjusted, depending on the outside air temperature: with lower outside air temperature, the volume flow rate is reduced. The use of adiabatic evaporative cooling and the compressor refrigeration system is not required at that stage. The process air is cooled down using indirect adiabatic evaporative cooling. The use of the compressor refrigeration system is not yet required. 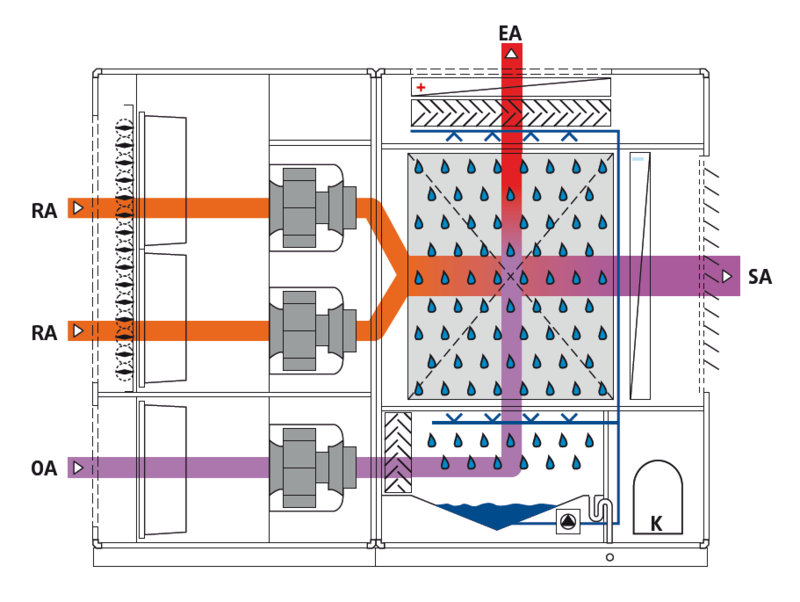 Even at low outside temperatures, heat exchange can take place using adiabatic humidification. As a result of this, the OA/EA volume flow rate dissipating the heat can be kept low, and this reduces the power consumption of the fan/motor unit. In summertime conditions at very high outside air temperatures and in addition to the adiabatic evaporative cooling, the compressor refrigeration system with output-controlled scroll compressors is activated. In the first stage, the outside air is humidified and then cooled through the evaporation of the water. The cooled outside air indirectly extracts heat from the warm process air in the recuperator. Thus, the process air is significantly cooled, but not humidified. In the second stage, the downstream evaporator is used to cool the process air to the desired supply air temperature. The heat extracted from the process air is transferred to the exhaust air. As the adiabatic evaporative cooling delivers approximately 50% of the required refrigeration capacity, the continuously adjustable compressor refrigeration system is correspondingly dimensioned for approximately 50% of the total cooling capacity. This allows the lowest possible pressure losses to be maintained at the evaporator and condenser. 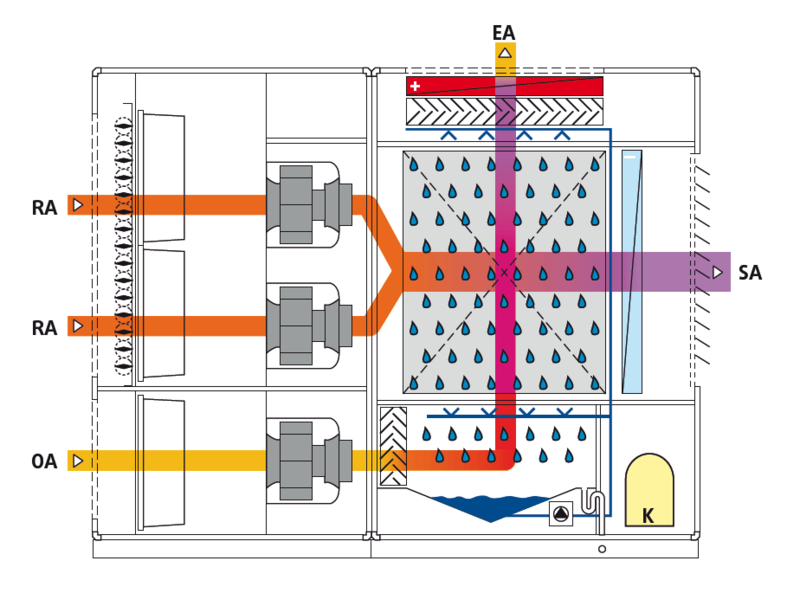 In order to prevent dehumidification of the process air, the outside air can be preheated by means of an integrated EA/OA bypass. This prevents condensation of the return air humidity in the recuperator. Via a warm water condenser, the heat extracted from the process air at the evaporator can be used for heating or hot process water. The integrated compressor refrigeration system operates as a heat pump in this mode. The control system ensures that the heat pump is primarily used when heat is required.